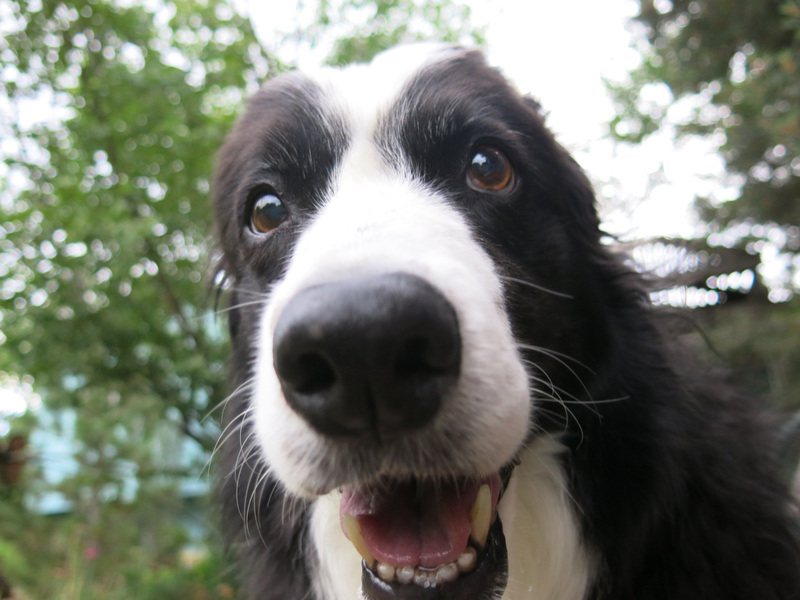 Namaste, everyone; once again it is I, Chess the purebred border collie, here to entertain you, because the guy I live with is suffering from ennui, or something similar. You may remember me from such posts as “Stinker’s Revenge” and “It’s Raining Flowers”, among many other delightful contributions. Like every red-blooded American male, the guy I live with is obsessed with his lawn. I bet he’s been sowing grass seed every single day for two months, and he just ordered a bag of Cody buffalograss seed from Stock Seed. This is to replace the mostly dead grass in the “way back” garden. The big brown area in the picture below is where he sowed some buffalograss seed, and some blue grama seed, but I think he forgot to use his Horticultural Ruler to measure the depth at which the buffalograss seed was planted. 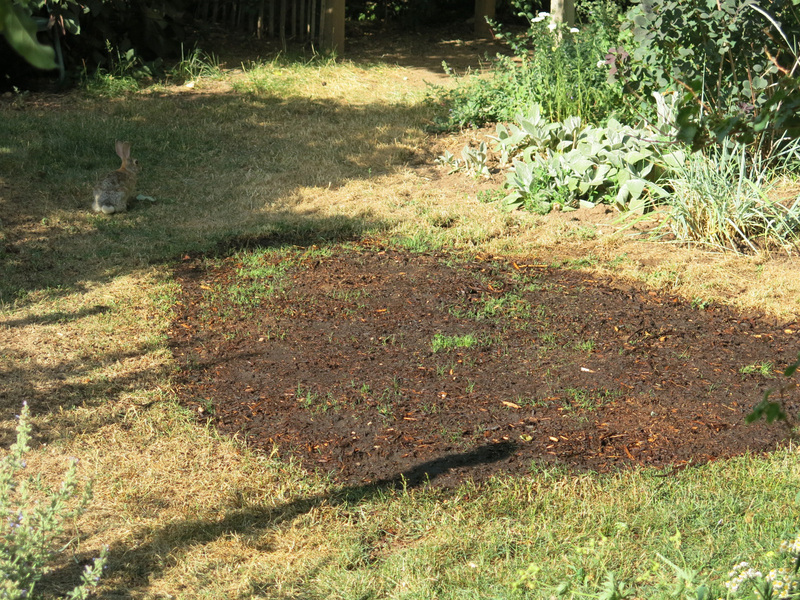 It’s only supposed to be planted ¼ to ½ inch deep. He says he might be able rake up some of the mulch and then the seed wouldn’t be planted too deeply, but I have this idea that that won’t work. The guy I live with also agreed to get rid of the gravel paths in the front lawn (still in the back yard, though), and replace them with wood mulch, so my paws wouldn’t get scratched. He started doing this, and then watered in the mulch, and of course it all flowed down the path and made a big mulchy pool at the lower end. I live with a genius. This is what it looked like before the mulch was put down. The guy I live with was a little too embarrassed to take a picture afterwards. If you study the first picture carefully, and the one below, you may see a pattern emerging here. Now, to back up just a bit, a couple of days ago we were just lounging around in the kitchen, the guy I live with was typing something on this laptop, and a mouse walked into the kitchen. The guy I live with said “Hey!” and the mouse walked out again. Shortly after that, and keeping in mind the pattern emerging in the two pictures I just showed, the guy I live with suggested that we get a cat. I couldn’t believe my ears. A cat. My grandpa Flurry lived with them here, and he said they were the most useless, smelliest creatures he’d ever known, and I began to worry that the guy I live with had completely lost his mind. A cat; this couldn’t possibly be true. You can tell what I thought of all this by the expression on my face. Surely he didn’t mean it. Well, he came to his senses surprisingly quickly. I think he could see by the look on my face that this was a really, really bad idea. So that was my close call. What a horrible, horrible thing to think about. Let’s look at some plants before I have to go. 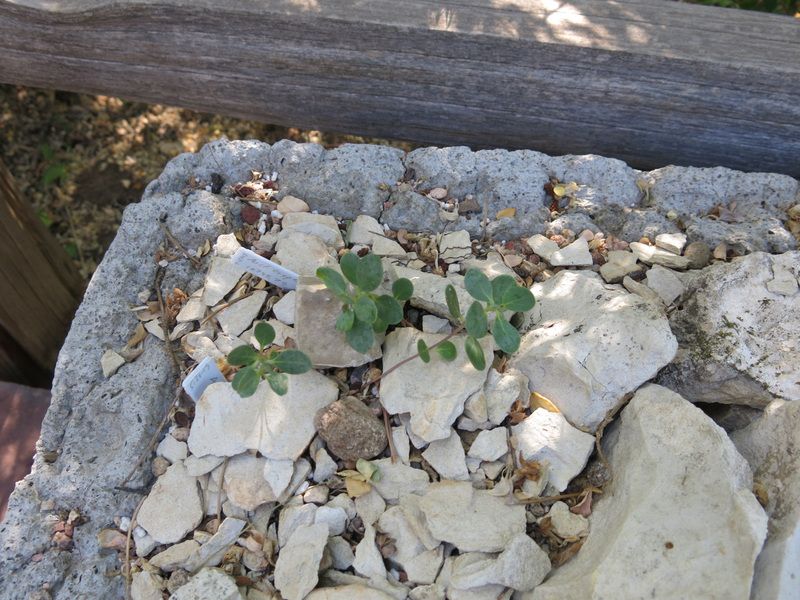 The little seedlings of Asclepias cryptoceras are still alive. That’s a big deal to at least one of us. There are hardly any flowers in the garden right now; it hasn’t rained in a very long time, and the guy I live with thinks dry gardens shouldn’t have many flowers at this time of year (my mommy disagreed, and liked to set sprinklers while he was at work). 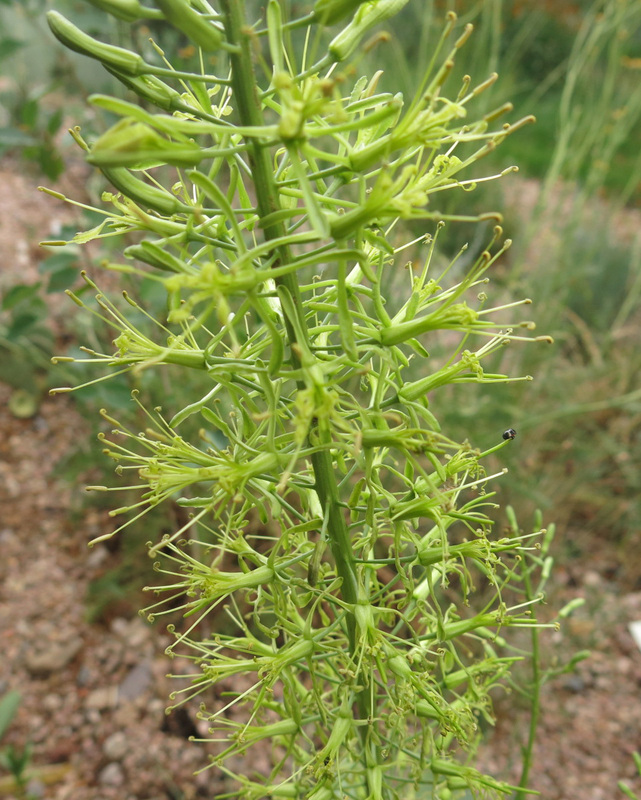 Here, though, is something slightly out of the ordinary, Stanleya viridiflora. Well, anyway, we aren’t getting a cat, thank goodness, so I can stretch out on my soft Pottery Barn sheets tonight, with the fan blowing cool air up my nose, without having to worry about some stinky creature jumping on me and clawing me to shreds. 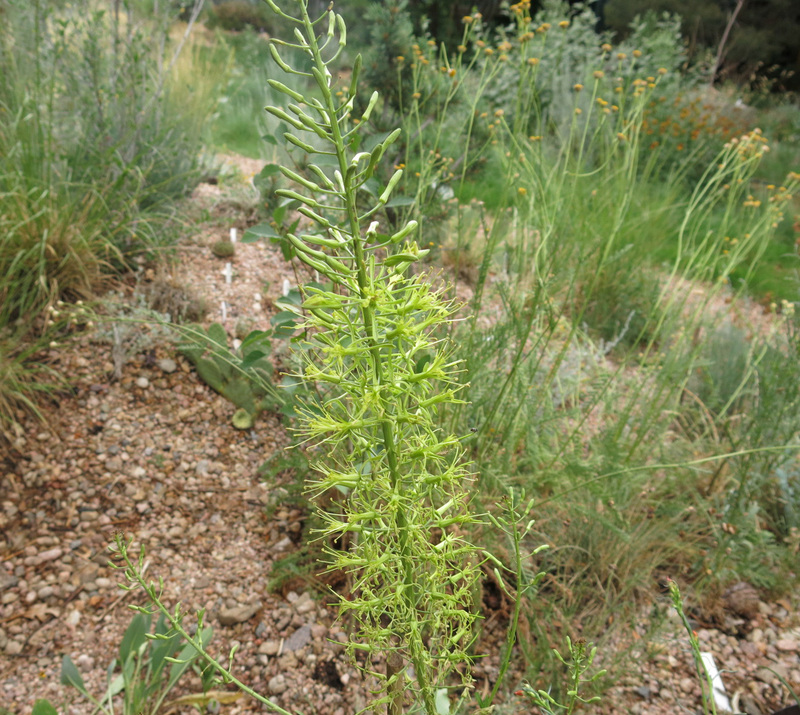 This entry was posted in Uncategorized and tagged Stanleya viridiflora. Bookmark the permalink. Whew. Close one. Maybe he was just joking. Pulling your chain. The only thing worse would be if he called it Thunder. Or Storm. Just joking. The mouse issue was resolved by putting mouse food out in the garage. ….The rabbit issue, whole other story. The cat named Thunder…sounds like a movie. Co-starring the dog who hides in the closet. Another gem Chess … you should get a diarist!!!! Probably should, huh. Though I sort of already have one. Yeah. That came from Great Basin Natives, now apparently out of business. Sigh. Leaves are less attractive than S. pinnata; they look like cabbagy-weedy things. Oh Chess, cats can be lots of fun! You can chase them all day and they always get blamed for knocking things off of shelves. Speaking of shelves, cats are really good at jumping up on kitchen counters and throwing food down to you. Are you sure you wouldn’t enjoy this sort of toy? With cat food breath? And “litter paw”? Ick. Border collies are models of cleanliness. Usually. I love cats. I like sniffing them and herding them around the house. I’m part border collie and part yellow lab, so I must know something. My grandpa Flurry said cats were smelly and icky, and I believe him. A cat once scratched my mommy’s nose, and she had a permanent scar. My grandpa Flurry was really, really smelly when he got old, and so if he said cats were smelly, well, then, I don’t want any. Cats are the second most useless creatures on the planet and I should know, I live with nine of them. The only thing more useless than a cat is a full time writer and I should know. I am one. 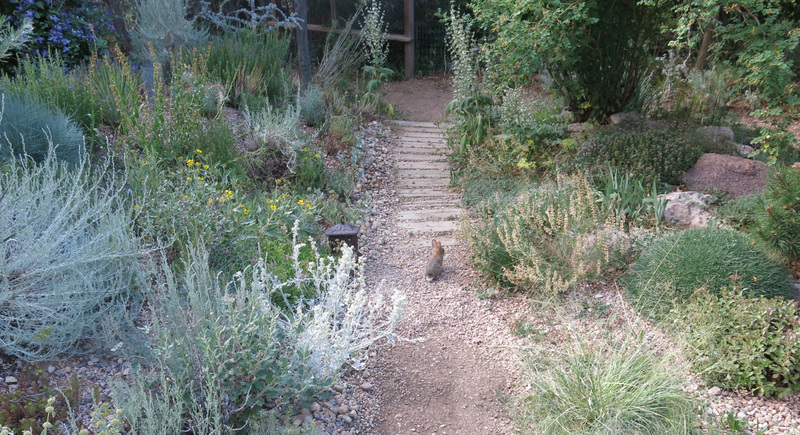 I love the look of the front garden but I agree that a mulch path would be kinder to little bunny feet. I used to embroider gardens and I’ve never seen a garden with more texture — I love imagining the embroidery stitches I would use to make all those spiky silvery bushes. Or shrubs. I don’t know the technical terminology, or the difference. Thanks, it’s mostly Artemisia frigida and things like that. It’s an herbaceous perennial, really “sometimes woody at the base”. A suffrutescent perennial. Sub-shrubby. A shrub has multiple woody branches, technically anyway. A tree has but one, technically. Some trees behave like shrubs, and some shrubs behave like trees, because they can’t read books which tell them how to behave. I write “an herbaceous perennial” because even though “they” now say that “a herbaceous perennial” is proper, it’s gross. I had cats when I met my wife-to-be. She wasn’t a cat person, but learned to like them. Then we decided to get a border collie, and the cats spent the rest of their lives in hiding. All they did before that was lie around the house and do absolutely nothing. Like me, now. LOVE that crucifer! My garden is dullsville too. You write good, Chess! Thanks. As long as you don’t look at the leaves, the stanleya is pretty cool. Now to track down the rest of the species…..Stanleya tomentosa looks particularly nice.